Educating people about seasonality and cooking simple, healthy meals. Innovative solutions to provide healthy meals in schools. Early learning and exposure in schools of the garden-to-tables (cafeteria) cycle. Green Tables committee members make a site visit to each grant recipient. Prior to the visit the recipient is asked to complete a series of questions so that the Green Tables Committee can better understand how funds were used, to see where successes and frustrations are, and open up the discussion of how we can help in our continued relationship with each recipient. 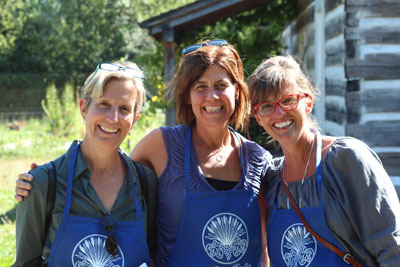 Each visit is inspirational – not only in seeing the gardens and programs but witnessing the hard work, determined spirit and love of the garden that each recipient shows.